In the kitchen -late today- - Wednesday | A.B.E. Remodeling, INC. Here it is Wednesday again…so let's think about a new recipe to try for "Wednesday in the kitchen". This recipe was found on www.mccormick.com and will put a splash of color unto your table. For those of you who like pasta - whip this one up and let us know what you think. Give pasta salad new life with a balsamic vinaigrette seasoned with basil and garlic salt. Mix oil, vinegar, basil, garlic salt and pepper in large bowl until well blended. 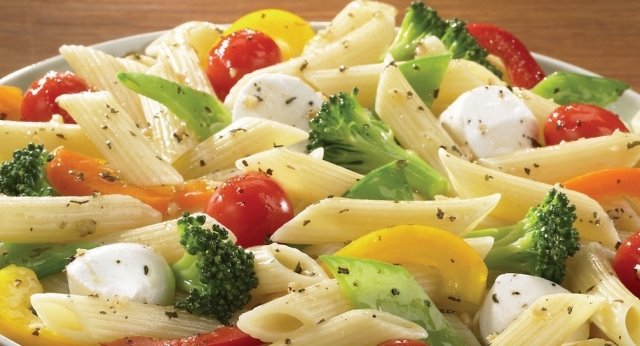 Add vegetables, pasta and cheese; toss to coat well. If ya give this recipe a try....- do share your comments. Until next post, be blessed, healthy and enjoy. All our best.